On Sam’s last business trip to Seattle, she set out to buy some new beans from the Seattle Coffee Works cafe to try some Seattle roasted coffees. As we all know, Seattle is known for a few famous and popular coffee brands, but we wanted to try something uniquely Seattle. I had caught wind of a special coffee blend that is made exclusively at SCW. It had a presidential quality to it. One that was equal parts funny and creative. It was the Obama blend, Indonesian origin beans mixed with East African to create a blend that was similar to the blend of our president. When we finally ground the coffee, it had a darker roasted smell to the beans. One would instantly realize this was no trendy San Francisco espresso roast. (It seems like the trend in San Francisco tends to be on the lighter roast side when it comes to espresso.) I tamped the grinds into the portafilter, and pulled some shots. The first straight espresso sip, was very bold, with that darker roasted taste (like the smell, duh!). As I let the taste linger in my mouth a bit, it started to fill my buds with a smokey-sour taste. A little too sour for my personal liking. Instantly, we realized this was a roast for drip coffee methods and not for espresso. I suppose some may like their espresso in this format, but the Ritual Nine Darling Road has spoiled my senses and is still my favorite, because of it’s lighter, floral (and campfire) taste. I eventually decided to try the beans in a French Press. This time, I set the grinder to a coarser setting and poured in about 5 tablespoons of coffee into the cylinder. I poured about a 14 ounce mug of boiling water and let it steep (percolate? coffee experts correct me on the terminology) for about 4 minutes. Around the 4 minute mark, I pressed down, and poured the coffee. The flavor of Obama was different, than with the espresso. It was still dark and smokey, but the coffee tasted sweet, with only a hint of the sour note. Definitely a lot better as a coffee than as an espresso. 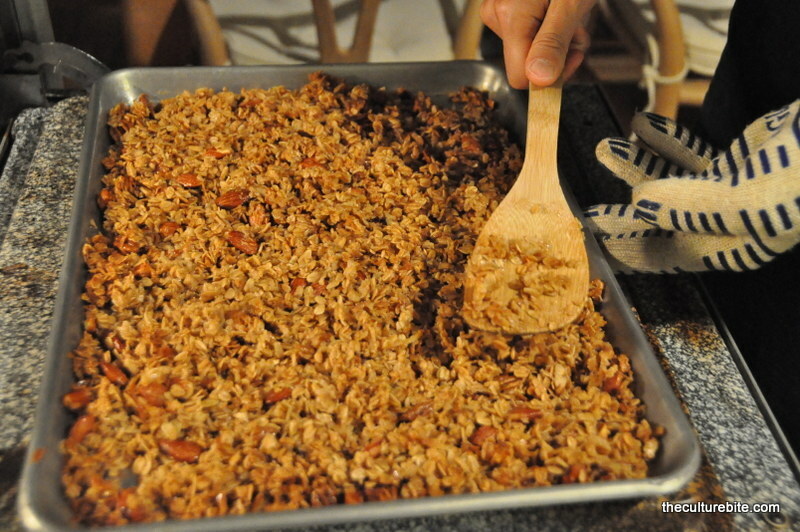 The other weekend, I had a sudden strong urge to bake up a batch of granola. I don’t get it because I hardly ever eat granola, and when I do, it’s usually out of a package and made by companies like Nature Valley and Quaker Oats. I’m always low on snacks around the house and I figured granola would be a “healthy” alternative to chips and cookies. I grabbed a granola recipe that my mother filed away from the Plumpjack Resort in Squaw Valley up in Tahoe that she raved was the “best granola ever.” One quick look at the recipe and I saw butter, maple syrup, corn syrup, honey. Okay, this wasn’t going to be healthy, but I’ve got the recipe in my hand and now I’m committed. I didn’t have all of the ingredients so this was my adaptation. Instructions: Preheat oven to 300°. Prepare a cookie sheet with cooking spray or lightly coat with butter. 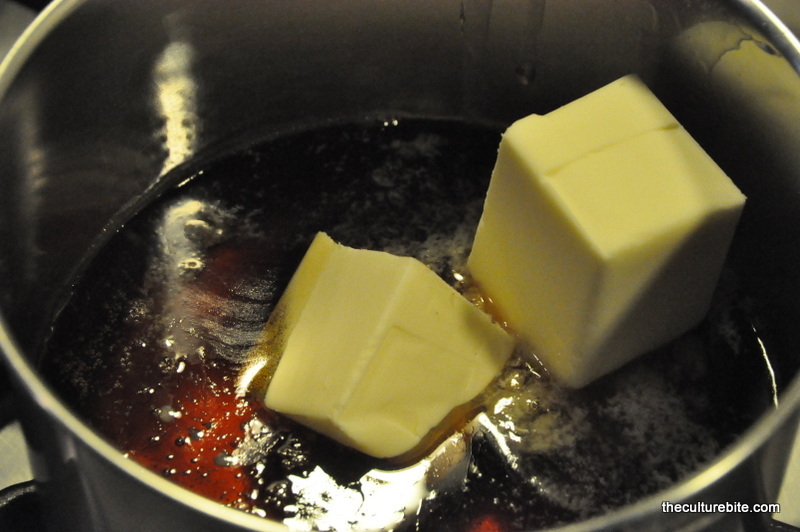 In a thick-bottomed pot, slowly bring the honey, butter, maple syrup and corn syrup to a boil. Boil the mixture for 5 minutes, watching it carefully as it can easily boil over. 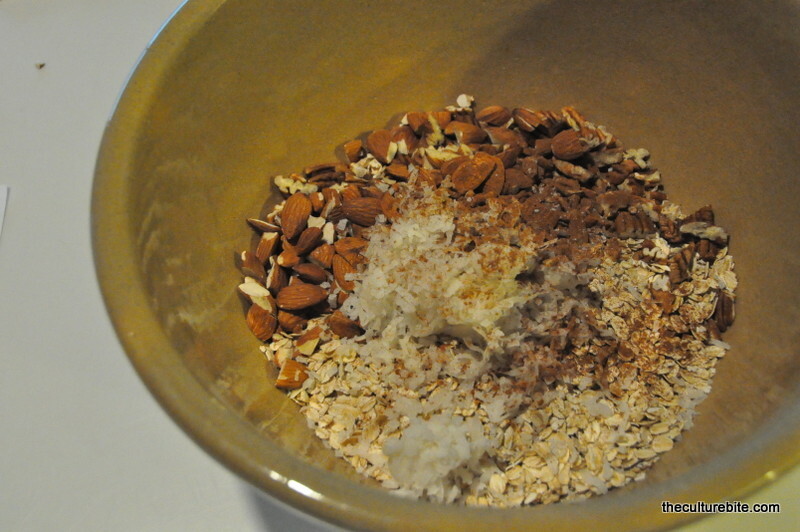 Meanwhile, combine the dry ingredients, except for the dried fruit, in a large bowl. I didn’t have millet, sesame seeds and wheat germ, so I substituted in an extra cup of oats. Pour hot syrup mixture over the dry ingredients, stirring carefully until completely combined. 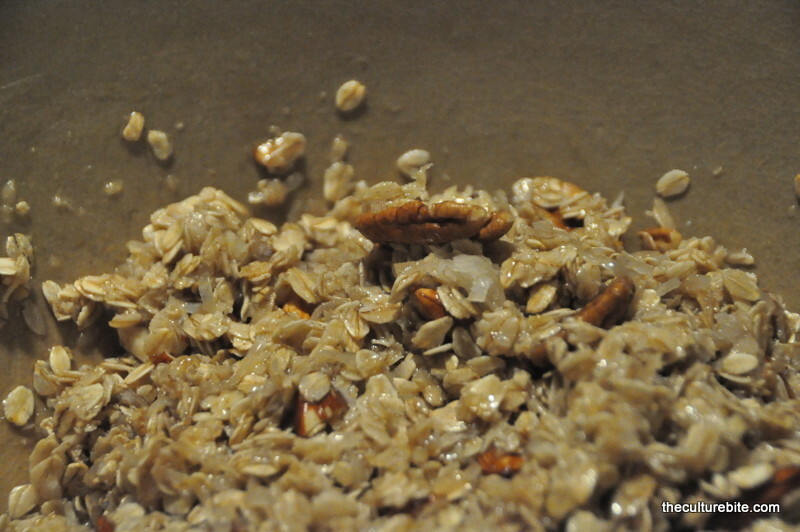 Pour granola mixture onto the prepared baking sheet and spread evenly. 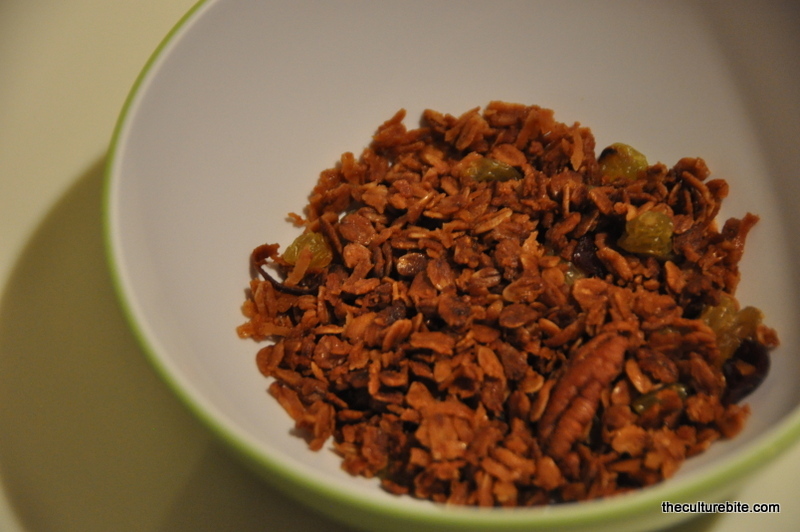 Bake granola for about 45 minutes to 1 hour, until golden brown throughout, stirring every 10 to 15 minutes. Remove from oven and leave at room temperature to cool completely, stirring every 10 minutes to prevent it from forming one large, hard sheet. Add dried fruit and toss to combine. I used golden raisins and dried cranberries, but I’m thinking dried apricots would be delish. Store in an airtight container for up to three weeks. Today, I had a few new things to look forward to. A new bag o’ beans, and now I have some help with frothing the milk with a new stainless steel pitcher and thermometer. The bag of beans was actually a trade I made with one of my coworkers, who I shall call Jetting Judy. I was asking her about the beans she liked to use for espresso at home, and she mentioned that her favorite was the Espresso from New York called The Laughing Man, bub. It’s a coffee source started by Hugh Jackman, aka Wolverine. So awesome! From the About Us page over at Laughing Man, Wolverine was in Ethiopia and made a promise to a coffee farmer to help produce and sell coffee to consumers with no middle men. So, this morning, I ground the beans with the “Tornado Claw” grinder and pretty much did everything the same. I made one double shot of espresso and it came out too watery. I tasted it straight, it had a little more sour note than the Ritual and Blue Bottle varieties and more chocolatey. Once I finished that, I decided to increase the fineness of the grind and try an extra double shot. This time it was a tad too fine (tomorrow I’ll get it right). The pull was really hard and there was some grinds that filtered through, with what appeared to be some healthy crema. I’m starting to think the beans have something to do with producing crema. Any experts out there want to verify? Once the espresso was pulled, I decided to test out the new pitcher. I filled some 1% milk into the pitcher, and started with frothing. The small diameter makes it a lot easier to have the milk swirl around, but I still need to work on that nozzle positioning. I’m still creating medium sized bubbles, ruining the goal of getting that nice consistent froth. The amount of time frothing increased, since it seems like the stainless steel didn’t heat up as fast as the glass. Banging the pitcher on the counter to bring the bubbles to the surface wasn’t as scary as well. The taste with the milk completely transformed it for me. For some reason, I’m getting a spice taste to it (possibly from the sour notes earlier.) It almost reminds me of a mellow chai tea with a rich chocolate taste. Napa Valley is a premier destination for wine tasting in Northern California, but the warm Mediterranean climate has attracted another burgeoning industry—olive oil. 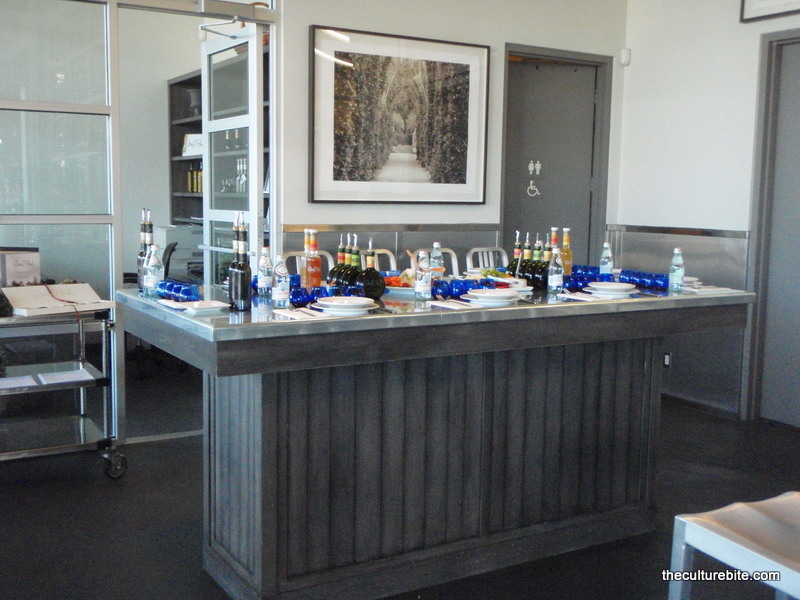 Olive oil tasting in Napa is perfect for the non-drinkers in wine country or those who just need a break between wineries. 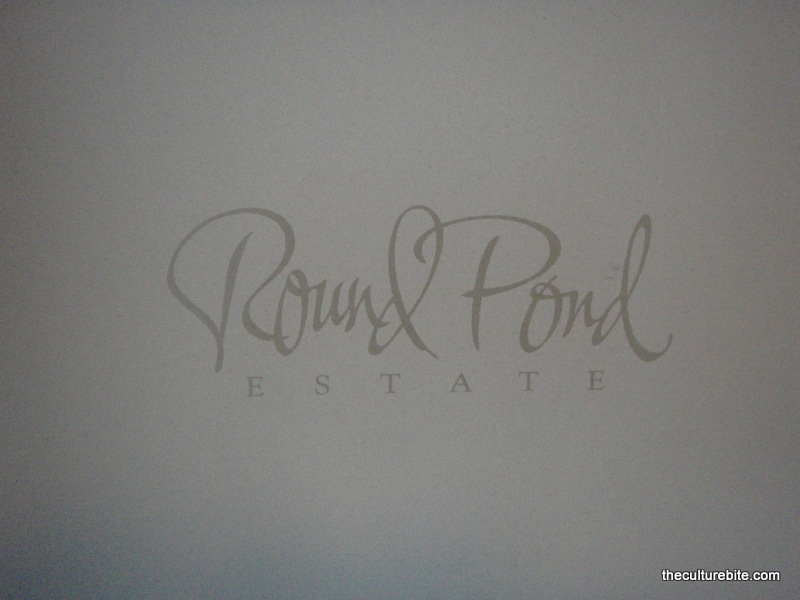 Round Pond Estate in Rutherford offers an intimate hour long tour of their olive mill with a very generous tasting meal for only $30. The tastings are appointment only, so call ahead to book. The tour through their mill is short and sweet, giving you just enough information to be interesting at a dinner party. 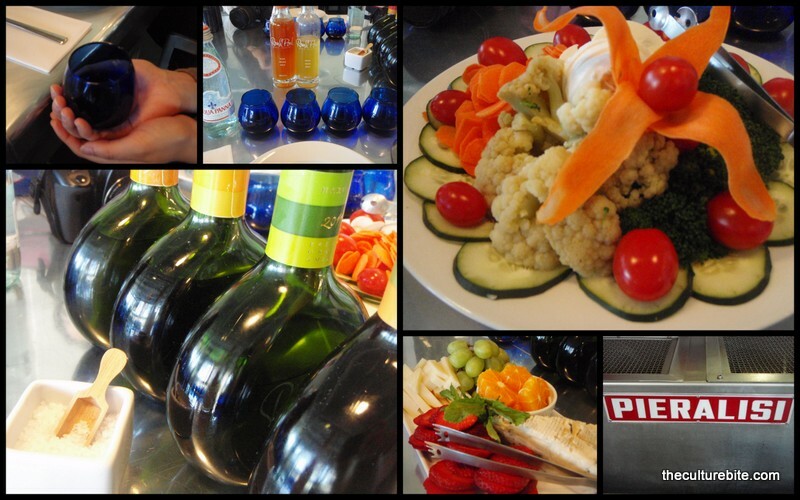 The rest of the time is spent at a communal table tasting the different oils with soft and hard cheeses and organic fruits and vegetables from their garden. Also on the tasting menu are a two of their vinegars and their citrus syrups. One piece of advice—plan to eat lunch or dinner here. There’s enough food here to get you stuffed! Side note: We also took a trip across the street to their winery. Both scenes seem to be under the radar and the architecture at both estates are amazing – modern, industrial and luxurious. I was planning on giving you a break from my mediocre barista skills this weekend, but I have some important news! I think I may have made my best cup of latte ever! I know what you are thinking, every time I make a new cup, it should be the best one ever because I’m starting at the bottom, but this one is noteworthy to me! I made some espresso that had so much crema that when it was dripping I couldn’t see the black liquid as the drops separated that rich light brown foam apart. That’s noteworthy, right? That, and with The Coffee Enabler’s advice, I started making a better looking cup of froth. Not the best yet, but I’m working on it. In other news, we just ordered a few other accessories: knockbox, frothing pitcher, and a thermometer.